In 1895, the city and the Union Depot decided it was time to replace the current station with a new station that better addressed the safety issues involved with a high volume of train traffic crossing High Street. That was done by raising North High Street so it passed over the train tracks and essentially meant building the new station on a series of arched brick vaults with tons of fill dirt being carried in to support the new road level and depot. This solution permanently removed the problem with pedestrian traffic being forced to cross the railroad tracks. However, the new street level caused some problems for businesses along the new raised section of North High and they had to create new entrances on their second floors. The above view of the station is looking northeast from the west side of North High Street. 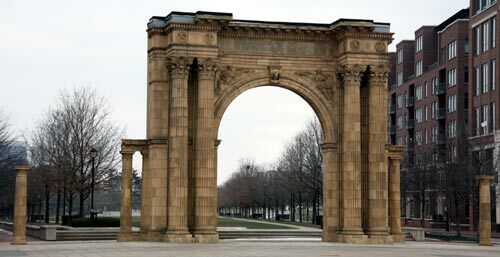 The main entrance arch is the arch that was preserved when the building was demolished in 1976. It is the furthest arch in the photograph. The nearest arch was torn down in a later remodeling project. The new Union Station opened in 1897. It was the age of Victorian era of architecture with lots of grand entrances, ornate details, and contrasting colors and building materials. It was designed by Daniel H. Burnham in the Neo-Roman style. It is a credit to Burnham for incorporating some of the features of the station #2, namely, the arches, into the final Union Station design. This elevated view of Union Station is taken from the west side of North High Street, looking south. You'll notice all of the wagons and buggies are horse-drawn, except for the electrified trolley car in the center of the street. In the background you can just barely see the rotunda of the Ohio Statehouse. The High Street facade featured 2 large triumphal arches flanked by fluted, Corinthian capital columns, topped by detailed decorations and sculptures. 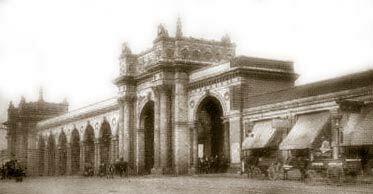 The portico running between the 2 triumphal arches also featured a series of smaller arches that provided easy access to the store fronts that lined the High Street side. At the time it was constructed, Union Station was called the finest, most ornate and most commodious depot in the Middle West. The new Union Station featured an elevated High Street that went over the tracks and entrances to the terminal through an arched portico. The train station was designed to be built on both sides of High Street and were connected underneath, however, the west side was not completed until years later. In 1928 the station was extensively remodeled and the large overhead roof structure was removed and elevated platforms with smaller roofs were built. In time train travel declined and the Union Station had finally outlived its long history. Attempts were made in the 1960s and early 70s to save the station, but with the age of the building and all the associated problems (with declining rail traffic, maintenance had been greatly neglected) it was decided to raze the station in favor of a more needed Convention Center. While many might argue the train station was more attractive than the contemporary Convention Center, the Convention Center is certainly more functional. 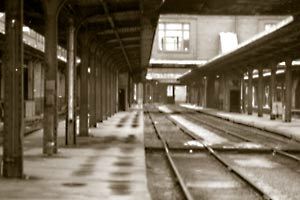 In the late 60s I frequently boarded a train to Chicago at Union Station. While the outside was quite charming to drive by, inside it was a dark, hulking shell of its former glory days. I was sad to see the station go, but the new North High Street is really a better place today than it ever was. I thought moving the arch was a bit stupid, and wished they could have incorporated it into the current plans— but at least a part of the station was saved for future generations to appreciate. These are 2 views taken track-side at Union Station in the 1970s. Passenger service had been suspended and the station was waiting to be torn down. 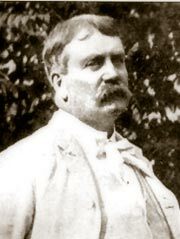 Daniel Burnham was an world famous American architect and urban planner. 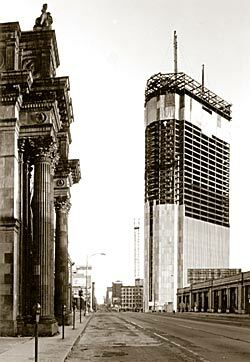 As a member of the Chicago School of Architecture, Burnham also designed the Wyandootte Building across from the Leveque Tower on West Broad Street. Burnham also designed Chicago's Montauk and LaSalle buildings as well as the 1893 Columbian Exhibition in Chicago.